I thought I could live without an Android tablet. When my Pixel C died, I figured that I’d just wait until another Pixel came out or the next Galaxy Tab. I could wait no longer! News is leaking rapidly about the Samsung Galaxy X phone, which folds its screen. I’m excited to see it (and potentially write a book about it). 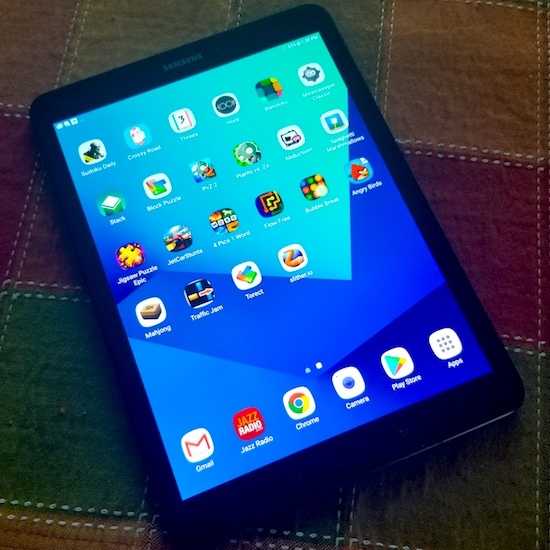 No word yet on a new Galactic Tablet, however, which is concerning given how long-in-the-tooth the “latest” model, the Samsung Galaxy Tab S3, has become. Even so, I bought one. Honestly, I miss having a tablet. I thought I could do without one, but I’m kind-of addicted. I like the larger screen, which is great for playing games and watching video. I also prefer having the tablet play music because its speakers are better placed and of better quality than my phone. So, recklessly and impulsively, I bought the Samsung Galaxy Tab S3. Like my Galaxy S8 phone, the S3 (shown in Figure 1) uses the latest Samsung interface. I was instantly used to controlling the device. The screen is excellent, which is what I’ve come to expect from Samsung. It still has a physical Home button, which the latest phones lack. And it’s missing Bixby, which is fine by me. Beyond that, the device has proven capable and I’m enjoying using it. Figure 1. My new Samsung S3 tablet. Samsung has their big roll-out event in a few weeks. It’s my hope that we see a new tablet from them at that time, or at least an announcement. I’d also like to see another Google tablet, like the Pixel C. I know they’re pushing Chromebooks now, but tablets still have their place, at least in my office.